Posted by Dave Emory ⋅ October 22, 2013Post a comment Email This Post Print This Post Tweet This! COMMENT: In FTR #724, we looked at the Santikitenan Park Association (also known as “The Family”), an intelligence-connected, fascist mind-control cult to which Julian Assange may well have belonged. A TIME review of the recent movie about WikiLeaks–“The Fifth Estate”–reinforces that working hypothesis. It is not clear what the writer’s source is for that assertion. 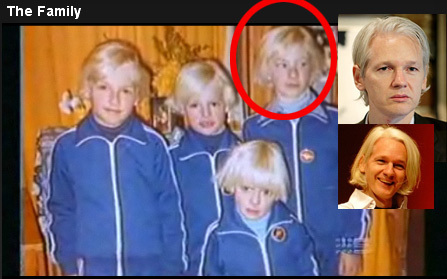 Photos of Assange, children of the cult are at right. Note the one child bearing striking resemblance to Assange. For more about the Assange/Family working hypothesis, see FTR #745.